Wellington Abbey was born April 22, 1840, in Clarke Twp., Newcastle Dist., Durham Co., Upper Canada, and died September 23, 1901, in Fond du Lac, Fond du Lac Co., WI, at age 61. Buried in Byron Cemetery, Byron Twp., Fond du Lac Co., WI. He is the son of Nathaniel Abner Abbey of Dutchess County, Province of New York, and Mary Louisa "Polly" Nugent of County Cavan, Ireland. Laura Estella "Stella" Watrous was born November 5, 1845, in Genesee Junction, Byron Twp., Monroe Co., NY, and died July 9, 1921, in Byron Twp., Fond du Lac, WI, at age 75. Buried in Byron Cemetery, Byron Twp., Fond du Lac Co., WI. She is the daughter of Colonel Russell Watrous of Byron Twp., Genesee Co., NY, and Louisa Beebe of Chesterfield, Hampshire Co., MA. Wellington Abbey and Laura Estella "Stella" Watrous were married March 28, 1866, in Byron Twp., Fond du Lac Co., WI. Mary Laura Abbey: Born June 16, 1867, in Byron Twp., Fond du Lac Co., WI; Died December 1, 1867, in Byron Twp., Fond du Lac Co., WI (age Infant). Buried in Byron Cemetery, Byron Twp., Fond du Lac Co., WI. George William Abbey: Born April 26, 1868, in Byron Twp., Fond du Lac Co., WI; Died April 3, 1943, in Minneapolis, Hennepin Co., MN (age 73). Buried in Saint Mary's Cemetery, Minneapolis, Hennepin Co., MN. Married Wednesday, April 25, 1900, in the parsonage of St. Peter's Church, Oshkosh, Winnebago Co., WI, to Regina Beatrice "Jean" Levy: Born September 4, 1875, in Oshkosh, Winnebago Co., WI; Died July 30, 1969, in Minneapolis, Hennepin Co., MN (age 93). Buried in Saint Mary's Cemetery, Minneapolis, Hennepin Co., MN. Albert A. "Bert" Abbey: Born June 9, 1872, in Byron Twp., Fond du Lac Co., WI; Died February, 1890, in Unknown (age 17). Buried in Byron Cemetery, Byron Twp., Fond du Lac Co., WI. Edith May Abbey: Born August 10, 1874, in Byron Twp., Fond du Lac Co., WI; Died March 21, 1951, in Lomira Twp., Dodge Co., WI (age 76). Buried in St. Paul's Lutheran Cemetery, Brownsville, Dodge Co., WI. Married November 17, 1891, in Byron, Fond du Lac Co., WI, to Anthony "Anton" Kuen: Born February 5, 1862, in Lomira Twp., Dodge Co., WI; Died November 18, 1944, in Lomira Twp., Dodge Co., WI (age 82). Buried in St. Paul's Lutheran Cemetery, Brownsville, Dodge Co., WI. Russell Lewis Abbey: Born May 9, 1882, in Byron Twp., Fond du Lac Co., WI; Died October 13, 1946, at St. Mary's Hospital, Rhinelander, Oneida Co., WI (age 64). Married Sept. 21, 1904, in Dorchester, Clark Co., WI, to Agnes Anna Schmidt: Born August 1884 in the Village of Dorchester, Mayville Twp., Clark Co., WI; Died August 29, 1961, in Rhinelander, Oneida Co., WI (age 77). 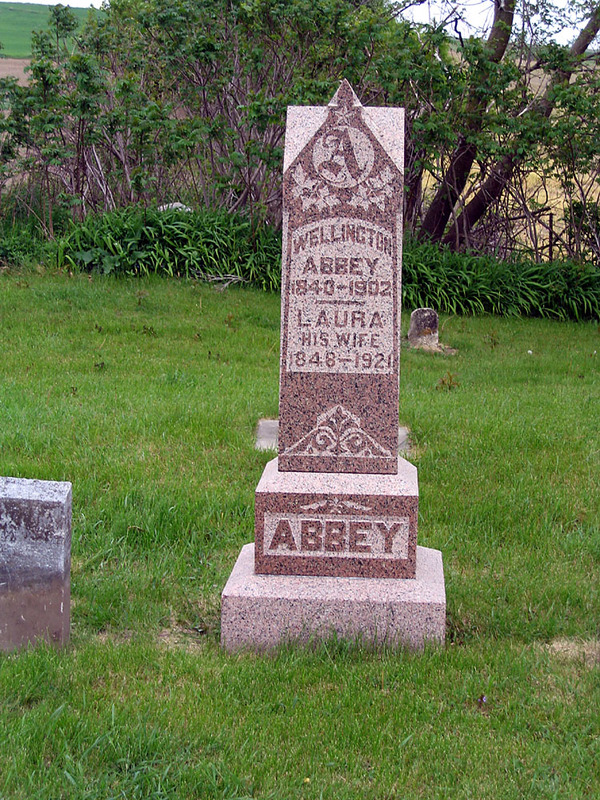 Unnamed Male Abbey: Born 1889 in Byron Twp., Fond du Lac Co., WI; Died 1889 in Byron Twp., Fond du Lac Co., WI (age Infant). Buried in Byron Cemetery, Byron Twp., Fond du Lac Co., WI. Wellington Abbey and Laura Estella "Stella" (Watrous) Abbey are buried in Byron Cemetery, Byron Twp., Fond du Lac Co., WI. Thanks to Find-A-Grave for making this picture available. Byron Cemetery. Located in the Town of Byron, Fond du Lac Co., WI in Section 27, reached by taking Hwy. 175 south of Fond du Lac for a distance of about 5 miles. The cemetery is on the northern edge of the Village of Byron on the east side of the highway. The cemetery is well kept. Michael Shidell and family members are also buried in this cemetery. 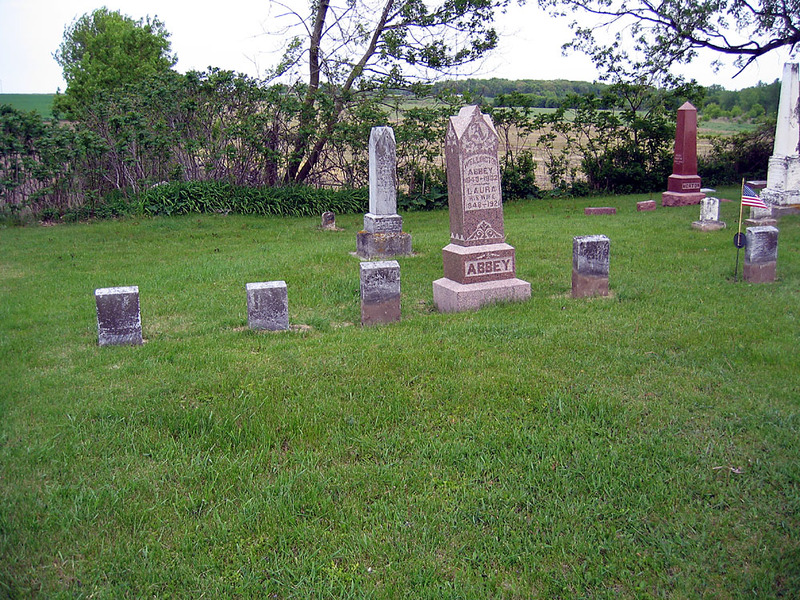 Records show the following are buried here, left to right: Infant, Mary L. 1868-1868; Bert, son 1872-1895; Wellington 1840-1902; Laura, his wife 1848-1921. All markers are no longer legible, but appear to have been recently reset (in 2003) to a proper depth. An adjacent grave marker is for Louis A. Ferris 1810-1894, and has a veteran marker. It seems to Leigh Larson that this is really the grave marker for Lovisa (Beebe) (Watrous) (Peoples) Ferris, the mother of Laura Estella (Watrous) Abbey. The veteran marker actually belongs to Wellington Abbey. Wellington Abbey was born April 22, 1840, in Clarke Twp., Newcastle Dist., Durham Co., Upper Canada. He was raised as a Baptist. 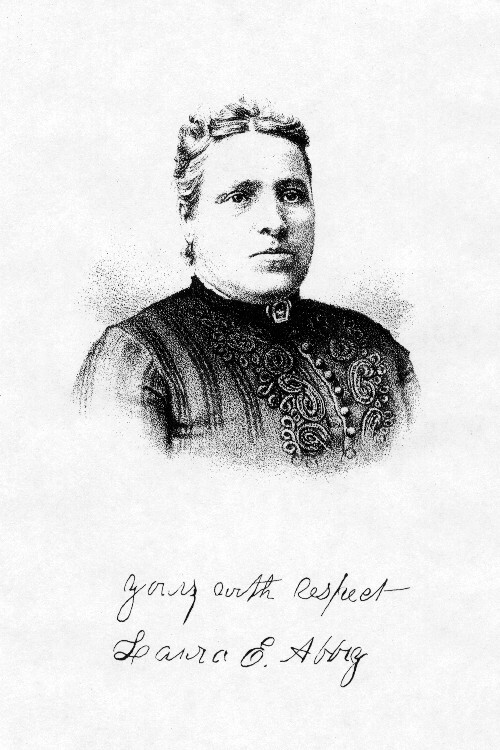 Laura Estella "Stella" Watrous was born November 5, 1845, in Genesee Junction, Monroe Co., NY. The 1860 U. S. Census taken on July 23, 1860, shows Wellington Abbey (age 20) born in Canada, is a Laborer, and is living with the Alfred Bliss family (Farmer) in Byron Twp., Fond du Lac Co., WI. Census Page 10 of 35. His brother Francis Abbey and sister Sarah (Abbey) Harris are listed on Census Page 9 living in the Henry Harris household, two farms away. The 1861 Canadian Census shows Barney Etcher (age 51) born in England is a married Farmer, and is living in a single story frame house in Hamilton Twp., Northumberland Co., Ontario, Canada. Living with him is a married woman, Mary Etcher (age 45) born in Ireland. Also living there are two unmarried people, both born in Upper Canada: Martha Etcher (age 12); and Wellington Abbey (age 21). Enlisted as a Corporal on 9 December 1861. Enlisted in Company A, 14th Infantry Regiment Wisconsin on 9 Dec 1861. Mustered Out Company A, 14th Infantry Regiment Wisconsin on 9 Oct 1865 at Mobile, AL. The 1870 U. S. Census taken on June 6, 1870, shows Wellington Aby (age 29) born in Canada West with real estate of $4,000 and personal estate of $700 is a Farmer living in Byron Twp., Fond du Lac Co., WI. Living with him is Laura Estelle Aby (age 24) born in New York, who is a House Keeper. Also living there are: George Aby (age 1) born in Wisconsin; and Orrin Aby (age 23) born in Canada West, a Farm Laborer. The 1875 Wisconsin State Census taken on June 1, 1875, shows Wellington Abby is the Head of Household and is living in Byron Twp., Fond du Lac Co., WI. Living in the household: 4 Males, 2 Females. The 1876 Centennial Directory for Fond Du Lac Co., WI, printed about March 20, 1876, shows Wellington Abbey (an American, married with 5 in the family) resides on 120 acres, s w corner section 20, in Byron Twp. The 1880 U. S. Census taken on June 7, 1880, shows Wellington Abbey (age 40) born in Canada to Canadian and Irish-born parents is a Farmer living in Byron Twp., Fond du Lac Co., WI. Living with him is his wife, Laura Abbey (age 34) born in New York to Massachusetts-born parents, who is Keeping House. Also living there are his children, all born in Wisconsin to Canadian and New York-born parents: George Abbey (age 11); Bert Abbey (age 7); and Edith Abbey (age 5). Two servants are also living in the household. The 1885 Veterans Schedule of ex-soldiers residing in Wisconsin shows Wellington Abbey, Corporal, Co. A, 14th Regiment, Wisconsin has Post Office of South Byron. The 1885 Wisconsin State Census taken on June 20, 1885, shows Wellington Abbey is the Head of Household and is living in Byron Twp., Fond du Lac Co., WI. Living in the household: 5 Males, 3 Females. Of these, 6 born in the United States, 1 born in British America. The 1890 Veterans Schedule shows Wellington Abbey is living in Byron Twp., Fond du Lac. Co., WI. The 1895 Wisconsin State Census taken on June 20, 1895, shows Wm. Abby is the Head of Household living in Byron Twp., Fond du Lac Co., WI. Living in the household: 4 Males, 1 Female. Of these, 4 born in the United States, 1 born in British America. The 1895 Veterans Schedule shows Wellington Abby was a Corporal in Co. A, 14th Wisconsin and is living in South Byron, Byron Twp., Fond du Lac Co., WI. The 1900 U. S. Census taken on June 19, 1900, shows Wellington Abbey (age 59) born April 1841 in English Canada to Canadian and Irish-born parents and having emigrated in 1848 and a Naturalized citizen is a Farmer owning his own farm free of a mortgage and is living in Byron Twp., Fond du Lac Co., WI. Living with him is his wife of 34 years, Estella L. Abbey (age 44) born November 1855 in New York to Scottish and Massachusetts-born parents, with 3 of the 6 children born to her still alive, who does Housekeeping. Also living there is his unmarried son, Louis R. Abbey (age 18) born May 1882 in Wisconsin to Canadian and New York-born parents, a Farm Laborer. An unmarried Farm Laborer Servant also lives in the household. In the fall of 1900 or 1901 Wellington Abbey retired to the City of Fond du Lac, Fond du Lac Co., WI. Wellington Abbey died September 23, 1901, in Fond du Lac, Fond du Lac Co., WI, at age 61. Buried in Byron Cemetery, Byron Twp., Fond du Lac Co., WI. Laura Estella "Stella" (Watrous) Abbey died July 9, 1921, in Fond du Lac, Fond du Lac Co., WI, at age 75. Buried in Byron Cemetery, Byron Twp., Fond du Lac Co., WI. This is a picture of the Watrous daughters. They are believed to be: back row - Juliette and Mary Jane; front row - Laura Estella, Isabelle Maria and Martha Jane. WELLINGTON ABBY, Sec. 20, P.O. 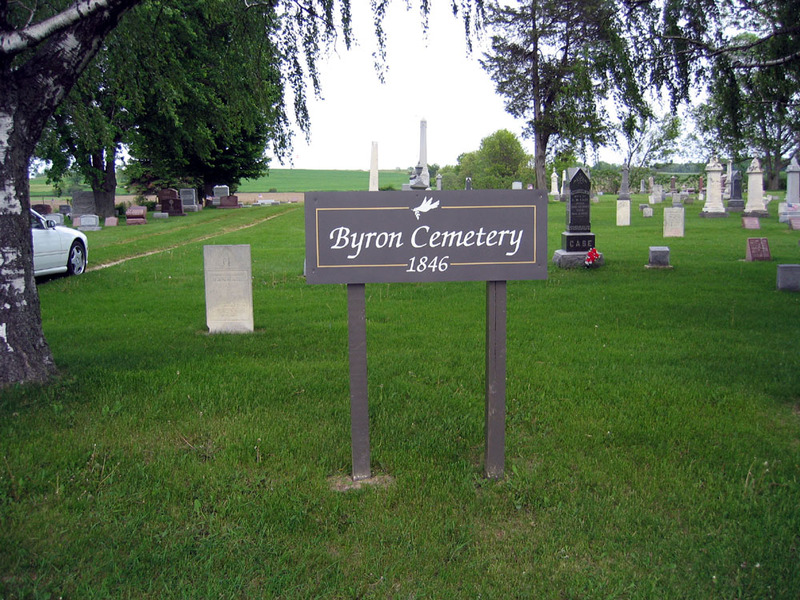 Byron; born in Canada West in 1840; son of Mary and Abner Abby, a carpenter and joiner and farmer; he was educated in the public schools; in the year 1850, went to Sheboygan Co., Wis., and, in 1852, came to Fond du Lac Co.; from that time he lived part of the time in Canada and part in this country, until 1861, when he joined Co. A, 14th W. V. I., and went to war and served through the entire war; was mustered out in 1865. Married in Byron, in the spring of 1866, to Estella L., daughter of Louisa and Russell Watrous, a carpenter and joiner living in Oakfield. He owns 120 acres of land, valued at $50 per acre. They have three children---George W., Burt and Edith M. Mr. A. is politically a Greenbacker. WELLINGTON ABBEY, a general farmer and stock raiser, residing on section 20, in the town of Byron, was born in Port Hope, Canada, on the 22d day of April, 1840, and is a son of Nathaniel A. and Mary (Neugent) Abbey. The paternal grandparents of our subject were natives of Dutchess County, N. Y., but shortly after the Revolutionary War removed to Canada, where Nathaniel Abbey was born. Nathaniel Abbey, the father of the family, was a carpenter by trade, but in connection with that business followed the occupation of farming. His death occurred in the month of March, 1849, and he was buried in the old cemetery near where he resided. He was a man of a quiet and retiring disposition, but received the respect of all who knew him. His wife survived him for many years. After the death of her husband she became a resident of Wisconsin, locating in Sheboygan County, where she purchased a claim, which had been entered by a Mr. Grant. For two years she made her home upon that farm, when, selling her interest to her deceased husband's brother, with her son Abner, she returned to Canada, where the remainder of her days were passed. She was a devoted member of the Baptist Church, and was beloved by all who knew her. She died at her home in Millbrook, Ontario, Canada, in 1888, and was laid to rest in the burying ground in that city. The subject of this sketch spent his early life in his native land. His father dying when he was but nine years old, and there being five younger children in the family, he was early thrown upon his own resources, and is truly a self-made man. When but fifteen years of age he began earning his own livelihood, and from that time has been dependent upon his own efforts. Of a hopeful and energetic disposition, he never gave way to the trials and difficulties with which he was surrounded, but pressed steadily forward to the end. His educational advantages were necessarily very limited, but possessing a retentive memory and an observing eye, he has largely supplemented the knowledge acquired from text books in his early years. Much of his leisure time has been spent in study, and in his home will be found a good library, together with many of the leading periodicals and papers. Few men are better informed on the issues of the day, or have a more extensive knowledge of the general affairs of the country. With the family Mr. Abbey left his native land, and in 1849 removed to Sheboygan County, Wis., where he resided until becoming a resident of Fond du Lac County in 1851. The greater part of his life has here since been passed, and he has been prominently identified with the history and progress of the community. 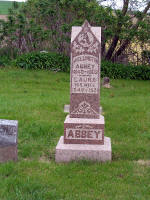 Leigh Larson note: The Abbey family is not listed in the 1850 U. S. Census for Sheboygan Co., WI. At the age of fifteen years he began working as a farm hand, and also engaged in various other occupations in order to earn a livelihood. 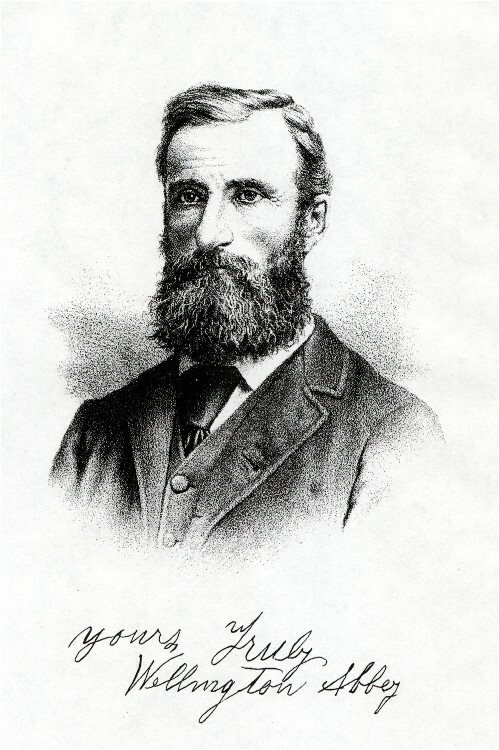 In 1851, the family returned to Canada, but Mr. Abbey remained a resident of Fond du Lac until the fall of 1859, when he visited his mother in his native country. The succeeding two years were spent at her home, but in the meantime he had watched with growing interest the preparations for war, which were steadily carried forward in the South. Returning to Wisconsin, on the 9th day of December, 1861, he could no longer withstand the desire to enlist, and offered his services to the country. He was assigned to Company A, of the 14th Regiment of Wisconsin Infantry, and passed the winter in camp. In March, 1862, the regiment was ordered to the front, and on arriving at the seat of war participated in the last day's battle of Shiloh. The gallant 14th captured the flag of the 17th Mississippi Regiment the day before the battle of Tupelo. They next participated in the battle of Tupelo, where a rebel ball passed through the hat of our subject. At the battle of Pittsburg Landing the regiment did effective service, then proceeded to Cornith, and after the engagement at that place, continued on to Vicksburg. In the siege against that city they made a desperate attack on the rebel works. During the thickest of the fight our subject saw his cousin, Charles Abbey, lying wounded upon the field, his feet toward the fort. Hastening to his side, he ascertained that a ball had passed through his right thigh. With a view of making him more comfortable, and if at all possible procure assistance, he raised him up, but just at that moment a ball, undoubtedly aimed at Wellington, struck Charles and pierced his heart. Mr. Abbey lifted him to his feet, and in his arms, amid the hiss of balls, and the heart-rendering screams of the wounded and dying, the brave soldier drew his last breath, and his spirit returned to Him who gave it. Victory was achieved, but the awful price was the lives of such brave men, who fell by the thousands. After the last sad rites were performed and the body of his loved cousin was consigned to its resting place, Mr. Abbey with a sad heart rejoined his regiment. After the siege of Vicksburg, with his comrades he participated in the battle of Holly Springs, where the supplies of the army were captured. They then embarked on vessels, and proceeded down the Mississippi River, where they secured a large quantity of cotton, and then continued on their way to Milliken's Bend, where the regiment was engaged in cutting a canal. Joining McPherson's corps they marched to Vicksburg, and thence to Nachez, where for some time they served as Provost Guard. Later they returned to Vicksburg again. The term of service of the regiment had then expired, but with nearly all of his comrades, Mr. Abbey re-enlisted, and was allowed to return home on a veteran furlough of thirty days. At the expiration of that time the members of the regiment again met at Vicksburg, and later proceeded on the Red River expedition under Gen. A. J. Smith, in which they captured Ft. Duressa. Unable to guard the place they blew up the magazine, and burst the cannon, pieces flying in every direction. When the work of destruction had been accomplished, the forces again embarked in boats with the intention of proceeding further on, but the news of Bank's defeat reaching them, they returned to Alexandria, where the rebels undertook to drive back the boats. They were unsuccessful. Gen. Green, their commander, having his head blown off in the encounter. In all the engagements of the Red River expedition the 14th Wisconsin Regiment nobly did its duty, and at Alexandria fought night and day. Returning to Memphis, the forces then proceeded against Gen. Forest, and after successfully accomplishing their task, that of routing the army, they went up White River to Little Rock, following Price through Arkansas. They marched on to Cape Girardeau, a distance of 365 miles, where they took boats and proceeded up the river to Jefferson City, and from there to Warrensburg, by rail. They next took part in the campaign against Hood, and later continued on to Eastport and Corinth, where they embarked, sailing down the Tennessee, Ohio and Mississippi rivers to Vicksburg and New Orleans. From Dauphin Island they crossed the bay to Fish River, and on by land to Spanish Fort. Foe eleven days they besieged the fort, which at length surrendered, when the forces were ordered to Montgomery, Ala. While in that city the news was received of the assassination of President Lincoln. The feeling of sadness and horror which pervaded the army at that time can better be imagined described. The regiment received its discharge at Mobile, Ala., Oct. 9, 1865. On the morning of that day Mr. Abbey laid to rest his brother, who was also his comrade during all the long years of service. He then turned his weary face homeward, and at length reached Fond du Lac County. His term of service continued almost through four years, during which time he was never known to shirk any task, but was always found at his post, faithful to the duty imposed upon him. On his return Mr. Abbey turned his attention to agricultural pursuits, purchasing a farm in the town of Byron, near Nightingale Corners. The first settlement in the town of Byron was in the year 1839; John Case and Oscar Pier, Patrick Kelley and William Stewart, selected a position and commenced the improvement of a neighborhood a little east of the middle of the north line of the town. Their location embraced a desirable variety of rich prairie, warm and fertile oak openings, and a beautiful grove of forest timber, with a small brook flowing through it. John Parsons, arriving direct from England, located upon a lot about a mile farther west. James Balson and Samuel Butler settled in this neighborhood in the fall of 1842. In the summer of 1844, John Potts, with his wife and four children, removed from the State of New York to Mound Prairie, in Byron. He set up crotches, upon which he laid long poles. He used prairie grass for a covering to this rude structure, and hung up blankets for its sides. Here he and his family were domiciled until he could build a house, obtaining hands from about ten miles distant to assist in rolling up the logs. Another settlement was soon after commenced by Hiram Merriam, Jabez C. Clemens and Jonas C. Reynolds, the last mentioned arriving in November. These pioneers on Mound Prairie, were, many of them, nearly destitute of capital when they arrived at their new homes. They were able, however, to purchase some cows, which were then very cheap in Illinois. They put their cows together for a team; broke up the prairie land, and planted corn on the sod in the spring. They realized a good harvest, and, although they met with some inconveniences, felt they were getting rich. In 1845, Messrs. Bullock, Churchill and Roan settled in the southeasterly part of the town, and in the month following, Sumner Sweet and Joseph Nightingale came into the same neighborhood. They were joined the same season by several others. Rev. Mr. Vaughn and some friends from the county of Genesee, N. Y., settled near Oakfield, and formed what was called the "Genesee neighborhood." The early settlers in Byron shared in all the privations and difficulties so common in new countries. They raised grain in abundance, but found it very difficult to get it ground; the few mills in this region were small and could not supply the demand. For several years the settlers went to Watertown, a distance of forty miles, to get their grinding done. The roads were bad, and they had to wait several days to get their grists. Mr. Vaughn once sent his son to mill, and told him to wait for his "grinding ;" he was gone ten days. Mr. Reynolds once paid $14.50 for the milling of twenty bushels, and did not think it more than an average cost. Byron was organized in 1846. William Stewart was elected Chairman, and Orrin Morris, at whose house the first election was held, Town Clerk. Its boundary lines were run by Mullett & Brink during the first quarter of 1834 and the second quarter of 1835. Hiram Burnham ran out the sections and quarter-sections in the third quarter of the last-mentioned year. The town has for its territory the whole of Township 14 north, in Range 17 east, of the Government survey. It contains 23,122 & 67/100 acres of land. The town is bounded on the north by Fond du Lac; on the east by Eden; on the south by Lomira, in Dodge County; and on the west by Oakfield. The face of the country, before improvements began, presented a pleasing variety of prairie, oak openings, marsh and timber land, undulated with gentle ascents and declivities. There is, however, one bold elevation where " the ridge passes through the town, which, in several places, breaks out with a rugged front. Springs and brooks are frequent, but not as abundant in this as in some of the other towns of the county. The springs furnish some of the headwaters of the east branch of Fond du Lac River. The southern part of Fond du Lac Prairie stretches into Byron. Mound Prairie, near the center of the town, is more elevated, lying above the ridge. The soil is generally fertile and easy of tillage, the more elevated part of the town being dry and warm. The first birth which occurred in Byron was that of Eliza, daughter of William Stewart, about the last of the year 1840. The first school taught was in the summer of 1843, in Mr. Butlers corn-barn, by Miss Mary Butler, afterward Mrs. F. Tallmadge. The first death was that of a German woman, in the summer of 1845. She came into the house of Joseph Nightingale - was greatly distressed; said she had just drunk heartily at the cold spring near by; lay down on a bench and immediately expired. Her name or place of residence was never learned. The first religious societies formed in Byron were Baptists, Methodists and Wesleyans. At the first town election, held April 7, 1846, it was voted that the officers chosen serve gratis. There were 34 votes polled - 18 in favor of a State government and 16 against it. At the second election, held April 6, 1847, a motion to allow Orrin Morris $16.50 for stationery as Town Clerk was lost, as was also a motion to allow C. P. Phelps $10 for serving as Assessor. At this election, 43 votes were cast against and 26 in favor of license; 43 in favor of, and 71 against the Constitution, and 43 in favor of and 33 against equal suffrage. Patrick Kelley and his family, who settled in Byron in September, 1839, were the first Irish to make Fond du Lac County a permanent home. The first German in Byron was Phillip Bodemar. The first schoolhouse was erected at the expense of five men, in 1841, on land donated by Patrick Kelley. The first preaching in the town was in this schoolhouse. The "Ledge" passes through Byron, on which, in Sections 20 and 29, is located the M. E. camp-ground, not far from the Narrow-Gauge Railway. In the vicinity of this camp-ground are many interesting natural curiosities, in the line of mighty masses of rent limestone and winding passage-ways into the "Ledge." Very large and cold springs are also found near this spot. A few months later he was united in marriage with Miss Laura Estella Watrous, the wedding ceremony taking place on the 28th day of March, 1866. The young couple began their domestic life upon the farm first purchased, and there made their home until 1873, when Mr. Abbey sold out and purchased 120 acres of land on section 20, Byron Township. He has since extended the boundaries of his farm, until it now comprises 485 acres, all under a high state of cultivation. It is one of the best farms in the township: the barns and outbuildings are models of convenience, the stock which he raises is all of good grades, and the many improvements which he has made are both useful and ornamental. He is industrious, and his home with its entire surroundings is characterized by neatness and regularity. Five children have been born of the union of Mr. and Mrs. Abbey, the eldest of whom died in infancy: George W., who was born April 26, 1868, is now engaged as a traveling salesman for the firm of Boyle Bros., of Fond du Lac; Albert A. was born June 9, 1872; Edith, Aug. 10, 1874; and Lewis R., the youngest, May 9, 1882. In his social relations Mr. Abbey is a member of the G. A. R., belonging to the local post of Fond du Lac. Politically, he is a Republican, and a strong advocate of prohibition principles. He gives of his means, and supports by his influence, all enterprises which are calculated to be of public benefit, and is ranked among the best citizens of the county. None are held in higher regard in the community than Wellington Abbey, who has so long and prominently been identified with its farming interests. Wellington Abbey, son of Nathaniel and Mary (Nugent) Abbey, born in Port Hope, Ontario, Canada, April 22. 1840; died in Fond du Lac, WI, September 23, 1901. As his father died when he was but a child, he was early thrown upon his own resources and from the time he was fifteen he was dependent upon his own efforts. While his early education was limited, he became a well-informed man due to his retentive memory and his constant habits of study. In his home were always found the leading papers and periodicals and a well-equipped library. With the family, he came from Canada to Sheboygan, WI, in 1849. In 1851, his mother with the other children returned to Canada and Wellington removed to Fond du Lac Co., where he afterward resided with the exception of two years, 1859 to 1861, which he spent with his mother in Canada. Returning to Wisconsin, he enlisted December 9, 1861, in Company A, 14th Wisconsin Infantry. After a winter in camp, the regiment was ordered to the front and participated in the last day of the Battle of Shiloh. The day before the Battle of Tupelo the 14th captured the flag of the 17th Mississippi Regiment, and participated in that battle, when a bullet passed through Mr. Abbey's hat. The regiment rendered effective service at the Battle of Pittsburg, then proceeded to Corinth and on to the Siege of Vicksburg. During the thickest of the fight, Mr. Abbey saw his cousin, Charles Abbey, lying wounded, a ball having passed through his right thigh. He raised him up in an effort to relieve him, and just at that moment a ball, undoubtedly aimed at Wellington, struck Charles and pierced him through the heart. After the Siege of Vicksburg, the regiment was in the Battle of Holly Springs, then embarked down the Mississippi where they assisted in the capture of a quantity of cotton and in digging a canal. They then saw service at Vicksburg and Natchez, and, after a furlough of thirty days, nearly all re-enlisted and proceeded on the Red River Expedition. During the rest of the war they were engaged in Arkansas and other states in the South and were in Montgomery when the news of Lincoln's assassination reached them. They were discharged at Mobile, AL, October 9, 1865, and after burying his brother Isaac, who died that very day, Wellington returned to Fond du Lac, and purchased a farm in Byron, which, with additions, became one of the best farms in the township. Mr. Abbey was a member of the G. A. R. and a strong advocate of prohibition principles. In the fall of 1901 he retired to Fond du Lac. He was buried in the cemetery near the little country church in Byron, where he had already erected a monument to his children who had died before. Married in Fond du Lac Co., March 28, 1866, Laura Estella Watrous, who survived him. 38. (*) Russell Watrous, born February 14, 1807 in Wallingford, New Haven County, CT; died November 09, 1849 in Oakfield, Fond du Lac County, WI. He was the son of 76. (Unknown) Watrous and 77. (Unknown) Unknown (Watrous). He married 39. (*) Lovisa BEEBE March 25, 1833 in Le Roy, Genesee County, NY. 39. (*) Lovisa BEEBE, born January 13, 1809 in Chesterfield, Hampshire County, MA; died Abt. 1895. She was the daughter of 78. (*) Richard BEEBE and 79. (*) Martha Thwing. (His parents may be Russell Watrous and Lydia Webb, m 5/28/1808, Saybrook, Middlesex, CT (in GLG database); must confirm. Must also determine whether this Russell Watrous relates to the Benjamin Waterhouse family tree (in database). He may have met his wife, Lovisa, through her brother, Abner, who was also a carpenter and joiner. A household was listed in the 1840 Census in Byron Township, Genessee County, NY, that is believed to have been his. The head of household was listed as "Russell Waters" and his household consisted on 1 male, age 20-30 (Russell, 33); 2 females, age under 5 (Isabel, 1, and Mary Jane, 3); 1 female, age 5-10 (Martha Jane, 6); and 1 female, age 20-30 (Lovisa, 31). Her given name is sometimes listed as "Louisa,", but most often as Lovisa (for example, in the 1880 Census). The latter is probably correct because a daughter of her sister Isabel had the middle name of Lovisa. This is a picture of her daughters. They are believed to be: back row--Juliette and Mary Jane; front row--Laura Estella, Isabelle Maria and Martha Jane. Her name was listed as "Louisa Watters" and she and her daughters Martha and Mary Jane were living with her brother Abner and his family. It is not known where her other daughters, Isabelle and Laura, were living. Juliette was living in Byron Township, Fond du Lac County, with the family of Elija D. Warner. The household also included "Larys A. Watrous," a male, age 4, that was listed with Lovisa's children; it is not known who he was, but she is reported to have had a son, Lemuel. She was listed in the household of her third husband, William J. Ferris, as well as William's son Francis and his family. Ruth Johnson's research notes that, after her husband died, "She was widowed with five daughters. She placed each of the girls except the baby in a different home as a housegirl in a well-to-do home. She worked as a cook and took the baby to work with her. Several of the girls married sons in the families where they were placed. Her name may have been Louisa instead of Lovisa." Martha Jane WATROUS, born December 28, 1833 in Byron, Genesee County, NY; died March 29, 1919 in LaGrange Township, Monroe County, WI; married (*) Samuel Hiram GRISWOLD October 31, 1851 in Fond du Lac, Fond du Lac County, WI. Mary Jane WATROUS, born August 26, 1836 in Byron, Genesee County, NY; died Aft. November 1909; married William Moore Allen June 08, 1856 in Byron Township, Fond du Lac County, WI; born September 16, 1831 in Lockport, Niagara County, NY; died February 11, 1877 in Byron Township, Fond du Lac County, WI. Her household consisted of Mary Jane and her children William, Minnie and Frank. She was a widow, and the census indicated that she had 4 children, of whom 2 were still living. Living with her was a 15-year-old grandson, but his name is not legible. His household consisted of William, age 38, born in NY; his wife, Mary Jane, age 33, born in NY; their son William Alph, age 13, born in Wisconsin; their daughter, Minnie Maria, age 9, born in Wisconsin; and their son Frank, age 3, born in Wisconsin. William's occupation was "farmer." His household consisted of William, Mary Jane and their son William, age 3. Isabelle Maria WATROUS, born January 04, 1839 in Byron, Genesee County, NY; died June 08, 1912 in Oakfield, Fond du Lac County, WI; married IX Nathaniel Phelps July 29, 1854 in Byron Township, Fond du Lac County, WI; born March 12, 1827 in Goshen, Hampshire County, MA; died February 10, 1902 in Oakfield, Fond du Lac County, WI. Her household consisted of herself and her daughter, Elsie, age 21. The census indicated that she had 7 children, of whom 6 were still living. In the 1900 Census, it listed Elsie as a granddaughter, so Isabelle may have adopted her after Elsie's mother died. He died of "hepatic carcinoma." His household consisted of Nathaniel, his wife Isabel, and their children Cora and Fred and their granddaughter Elsie. It indicates that they had been married for 44 years and had 6 children, of which all 6 were still living. His household consisted of Nathaniel, age 32; his wife Isabel, age 22; their daughter Ellen, age 3; their daughter Julia, age 1; and Henry McClain, a 16-year-old "laborer." His household consisted of Nathaniel, his wife Isabel, and their children Julia, Elmer, Cora, Flora and Frederick. His household consisted of Nathaniel, his wife Isabel, and their children Ellen, Julia, Elmer, Cora and Flora. "Nathaniel Phelps, farmer; Secs. 20 and 29; P.O. Byron; owns 1031 acres; probable value, $65 per acre. Born in Goshen, Mass., in 1826; son of Nathaniel and Sarah Phelps; his father was by occupation a farmer; the subject of this sketch was educated in the common schools of his native place, and was brought up on a farm; he came to Wisconsin in 1852, and located in Byron, where he has remained ever since. He was married, in July, 1854, to Isabel, daughter of Louisa and Russell Watrous, the latter a carpenter and joiner living in Oakfield; they have had six children—Ellen M. (now married), Juliet B., Elmer N., Cora L., Flora E. and Fred R. They are members of the Wesleyan Methodist Church; politically, Mr. Phelps is a Greenbacker." Juliette Arabelle Watrous, born June 07, 1843 in Byron, Genesee County, NY; died November 21, 1924 in Rhinelander, Oneida County, WI; married Edward Bruce Crofoot November 21, 1861 in Fond du Lac County, WI; born October 09, 1842 in Kaukana, Brown County, WI; died September 04, 1904 in Rhinelander, Oneida County, WI. She was living with her son Charles and his family. She was listed as "Juliet Watters, " age 6, born in NY, and was living with the family of Elijah D. Warner. REMARKS: He was raised on a farm in east central Wisconsin. At age 18 he enlisted in the First Wisconsin Infantry on 17 April 1861. He re-enlisted at least once and served under Gen. Patterson in the Shenandoah Valley. He again re-enlisted 15 Aug 1862 In Co. A of the 32nd Wisconsin Volunteer Infantry. He served as First Sgt.,2nd Lt., and 1st Lt. He served under Gen. Sherman on Shermans March to the Sea, and was wounded in action near Atlanta. He conducted a dairy business near Fond Du Lac, Wis. and the lumber business in Marathon County. He moved to Rhinelander Wis.in 1885 as foreman of the Brown Brothers mill and yards. In 1892 he supervised the building of a mill in Choate, Ontonagon Co. Michigan. At this time he homesteaded land on what is now the West Side of Rhinelander. Portions of the original home still are located on Hwy. K as you enter the city. Here he also conducted a dairy business and also spent some time as superintendent of lumber mills in Choate, Ontonagon Cty. Michigan. He was married in November of 1861 to Juliet A. Watrous and they had three children; Elsie B., Charles S., and Alta A. He was a Royal Arch Mason and the Second Master of the Masonic Lodge ofRhinelander Wis. He was a charter member of the Rhinelander Lodge #242. He was also a member of the I.O.O.F. (International Order of Odd Fellows), and the G.A.R ( Grand Army of the Republic). He attended the Methodist Church and was the First President of the Rhinelander School Board and also a member of the County Board, and a strong Republican. He died when he fell in the canal above the papermill. His body was found near the chain slip used for conveying the timber from the canal to the mill-evidently he fell in and drowned. His wife was listed as a widow in the 1920 Census. in the Civil War in the 1st Wisconsin Infantry. His great-grandson, Edward Crofoot, has a sword and several military artifacts owned by Edward. They moved to Rhinelander from Kewaskum, Washington County, WI, in 1885. Laura Estella "Estelle" Watrous, born November 05, 1845 in Genesee Junction, Monroe County, NY; died July 09, 1921 in Byron Township, Fond du Lac County, WI; married Wellington Abbey March 28, 1866 in Byron Township, Fond du Lac County, WI; born April 22, 1840 in Port Hope, Ontario, Canada; died September 23, 1901 in Byron Township, Fond du Lac County, WI. (She was not listed with her mother and siblings in the 1850 or 1860 Census.). She was listed as "Laura Estelle." He was a laborer at the farm of Alfred Bliss. His household consisted of Wellington, his wife Laura, and their children George, Bert and Edith, as well as two servants. His household consisted of Wellington, his wife Laura, their son George, and Orrin Abbey, age 23, a "farm laborer" born in Canada. Orrin was very possibly a brother of Wellington. His household consisted of Wellington, his wife Laura, their son "Louis" and a servant. His name appears to be listed as "Larys A." in the 1850 Census record. Isabel M. Phelps, widow of Nathaniel Phelps and a pioneer resident of Fond du Lac county, died at her home in Oakfield at 10 o'clock Saturday morning, after an illness of several months. Isabel Maria Watrous was born in the town of Byron, Genessee county, N.Y., Jan. 4, 1839. In 1846, when she was seven years of age, the family came to Wisconsin residing in the town of Byron, in the vicinity of Genessee. She was married in 1855 to Nathaniel Phelps, who death occurred ten years ago. The greater part of their life, with the exception of four years which were passed in Fond du Lac, was spent on their farm in Byron, until they went to Oakfield to reside about fifteen years ago. Both became members of the Wesleyan Methodist church during their early married life, to which faith the remained constant until the end. Six children remain to survive their loss. 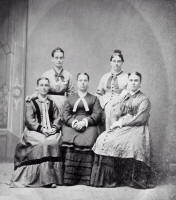 Four daughters, Mrs. C. B. Culver, Mrs. Geo. H. Taylor, Mrs. E. W. McKnight, and Elsie, two sons, Elmer and Fred, all of Oakfield. 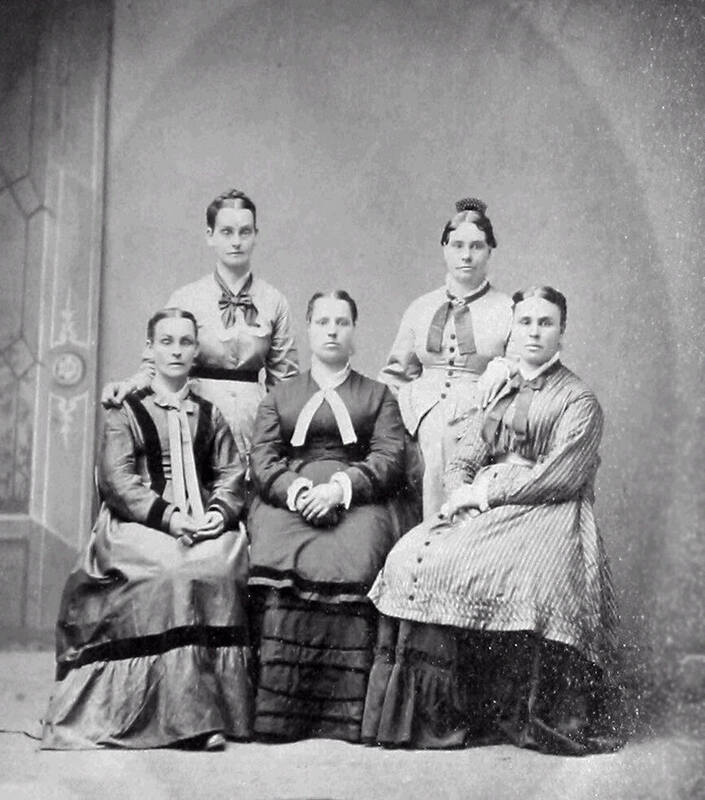 Four sisters, Mrs. Martha Griswold, of Tomah, Wis., Mrs. Mary J. Allen, Oshkosh, Mrs. Juliette Crofoot, Rhinelander, and Mrs. Estella Abbey, Fond du Lac. One daughter, Mrs. Cora Olds, passed away three years ago. The funeral will be held Tuesday morning at 10:30 o'clock at the residence and at 11 o'clock at the M.E. church, Rev. Sabin Halsey officiating, with interment at Avoca cemetery.